Throughout 2017, Dunn Solutions is keeping up with Daniel Westbrook as he restores this historic Seattle residence. This post is part of the ongoing series. For other related posts, click here. Most installed cabinets are what I call stock cabinets: standard cabinets that are usually manufactured according to a specific system, size, and color. The customer chooses what they want within the confines of that manufacturer’s offerings, and the kitchen is designed around the cabinets. Custom cabinets are just the opposite: The cabinet is designed and built around the unique features of the project and specific desires of the customer. Semi-custom cabinets are, as you would guess, a hybrid between stock and custom cabinets and give more flexibility within a cabinet manufacturer's parameters. Today, we're looking at the installation of custom cabinets, and the specifics of how to install them versus stock cabinets or semi-custom cabinets. 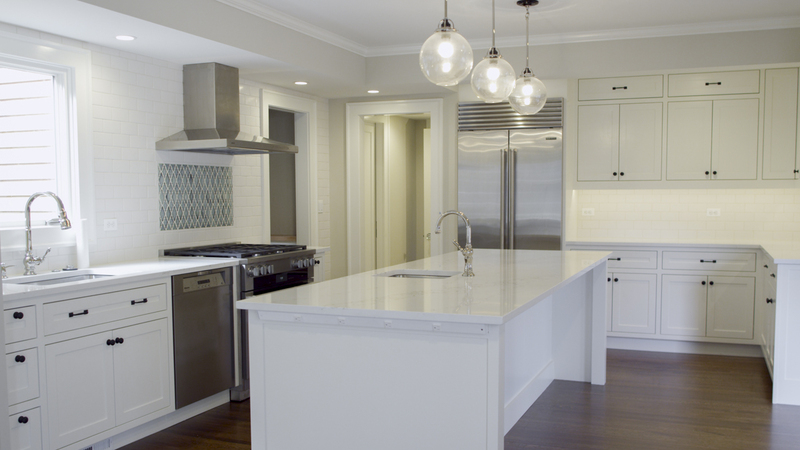 For more on the differences between stock, semi-custom, and custom cabinets, visit this post. 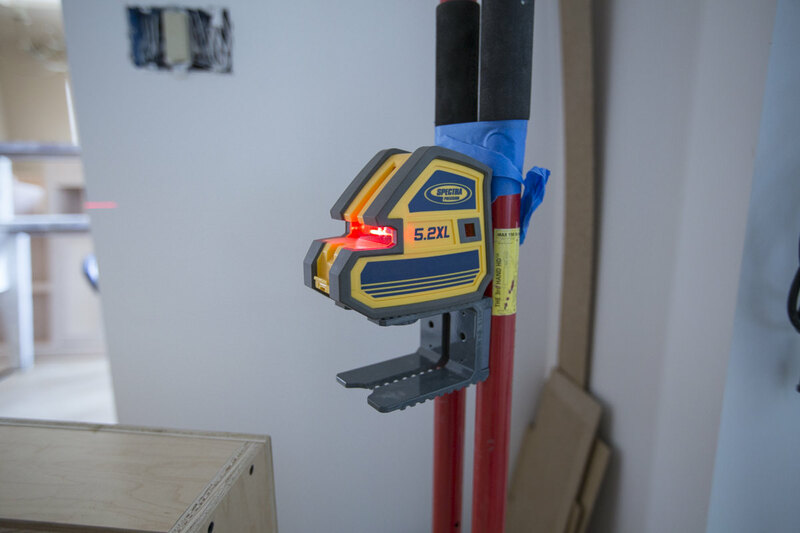 When installing custom cabinets, begin by setting up a laser level as a point of reference. 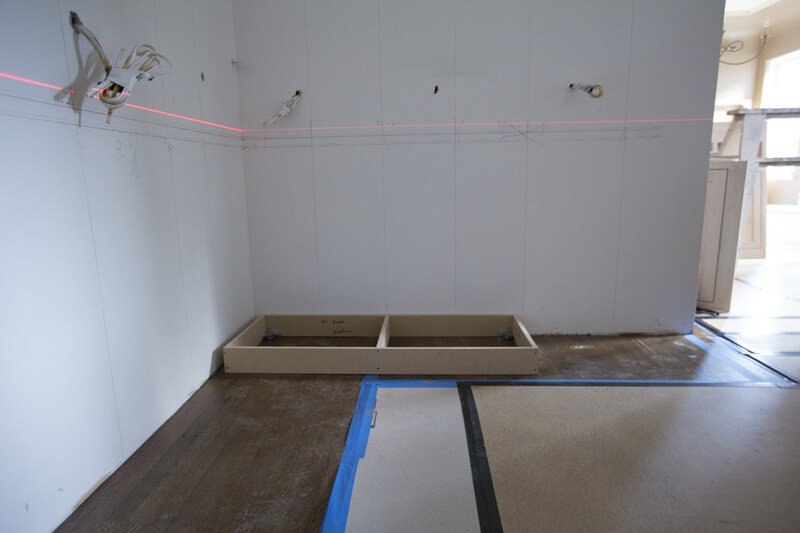 To find the high spots in the floor, take a tape measure from the laser level line down to the floor in various places where the base cabinets will sit. Then do it again, this time measuring up toward the ceiling. Floors and ceilings are rarely level, and they most certainly are never flat. It’s important to measure so you get a feel for the variations in counter height—a 2" difference will be felt standing at the counter, but a ½" difference probably won’t. Next, measure from the walls out to the toe kick, marking once every two feet around the kitchen where the base cabinets interface with the floor. Do the same with the ceiling (about a foot out from the wall) and mark the lowest spot. In most cases, cabinets should be set level from the high spot in the floor and the low spot on the ceiling. Having that baseline to work from allows a level installation of both upper and lower cabinets—even when the floor and ceiling are not uniform. If possible, upper and lower cabinets should also be set parallel with each other for a consistent backsplash. This is why a laser level is so handy! Most walls (like floors) have humps of varying degrees, and usually aren’t plumb. The cabinet horizontal face has to be set in a straight line. Using a 6' level as a horizontal straightedge along the walls helps identify any humps. These should be marked with a pencil by drawing a circle around that area. 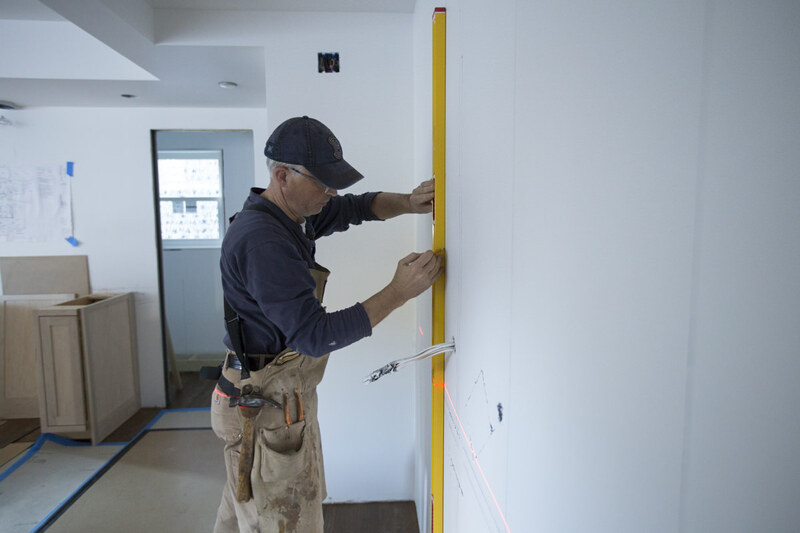 Using a vertically placed level, identify how much the walls are out of plumb (leaning out or leaning in from top to bottom). This is important not only because the face of the cabinets need to be straight, but because they need to align with vertical end panels such as a refrigerator floor or bulkhead. This is why I draw all cabinets on the wall before I set them—all the high points that have been identified on the floor, walls, and ceiling become the point from which everything is measured. It then becomes a bit like a life-size architectural drawing, and because the cabinets are on site, it’s a simple matter of measuring the face frames and transferring that into the wall drawings. Often, custom cabinets are made with the toe kicks as separate units from the base cabinets—the toe kicks need to be installed first. The kicks for these custom cabinets have adjustable feet that screw up or down as needed so it’s easy to create a perfectly secure platform to set the base boxes on. These adjustable feet take the place of shims. The main thing to keep track of is how far back the toe kick should be from the face of the cabinet, especially for something like an island cabinet. 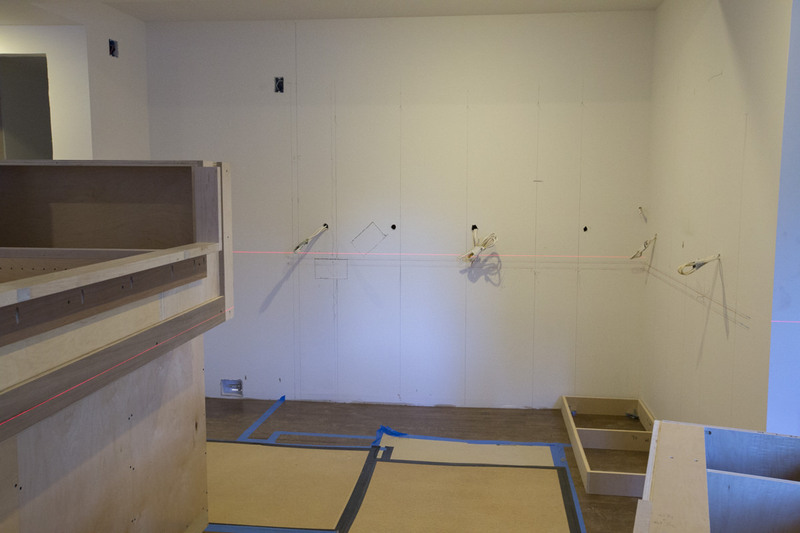 To do that, begin by laying a line of blue tape on the floor for the perimeter of the island cabinet. Then, measure back to the face of the toe kicks and lay tape where they will be located. Once you have the toe kicks in place, cut the blocking that will screw into the floor on the inside of the toe kick in various places, and secure the toe kick to that blocking with a screw. 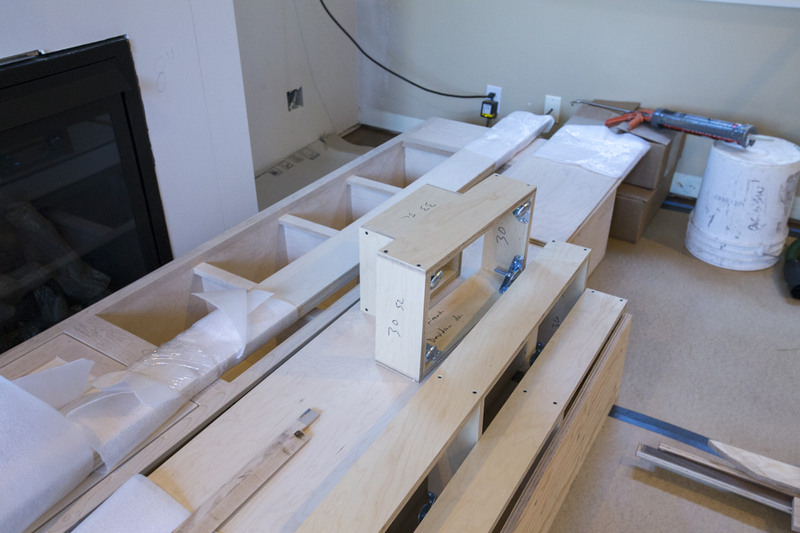 This step is especially important with an island cabinet that isn’t secured into a wall. Custom cabinets are made with extra length on the frames or panels for scribing, cutting, and fitting to account for out-of-plumb walls, uneven floors, or irregular surfaces. When starting at an inside corner with a cabinet face frame, this extra wood will need scribing to the profile of the wall and then need to be cut off. To find out how much to cut off, set the cabinet on the toe kick and carefully slide it so the face frame barely touches the wall at any one point along its surface, and then stop. Go to the other end of the cabinet and measure how much needs to be cut off to line the cabinet where it should be based on the drawings on the walls. 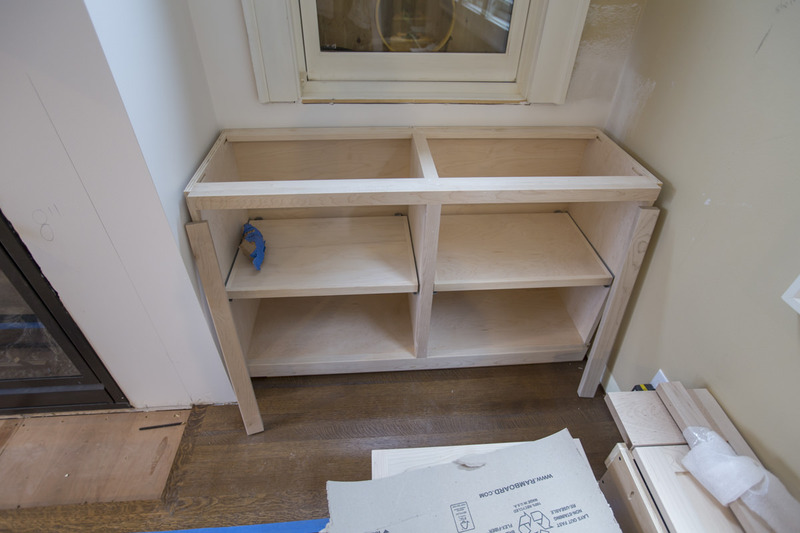 Let’s say the cabinet needs to move another ½" toward the inside corner wall—that’s how much should be cut off. Cut a ½" block and use that as a scribe spacer, then put the pencil on the face of that block and scribe the face of the frame on the cabinet. That becomes the line to cut. Rarely is this line straight, so it should be done freehand. I like to use a circular saw with a high-quality blade. To ensure a tight fit, make sure the cut is beveled a couple degrees toward the back of the face frame so the front of the frame is the long point. All face frames that intersect walls with upper and lower cabinets are done in much the same way. One thing to note is that because these are raw wood cabinets, I’ll sometimes have the vertical face frames that intersect walls shipped loose so I can secure the cabinet, perform the scribe and cut, and then install the face frame with glue and finish nails. This becomes necessary when dealing with a cabinet that has an intersecting inside corner wall on either end. Start the installation at the inside corners of the room and work outward. The cabinet boxes on this project were already mulled together with pocket screws where the rail face frame connects with the stile of the next cabinet. 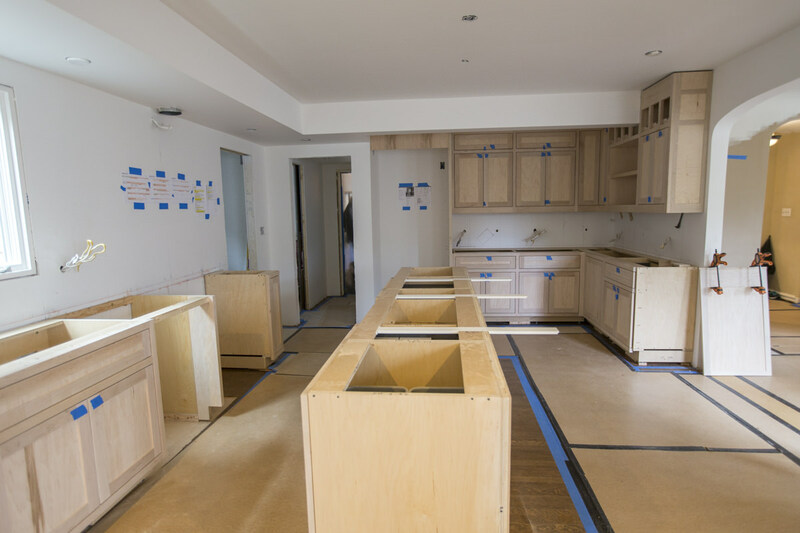 Because these are custom cabinets, these sections are pre-built into larger custom units, disassembled for transport, and then reassembled on site. This custom technique eliminates the need for mulling together a bunch of smaller individual cabinet units, where a vertical face frame seam shows up between every cabinet. 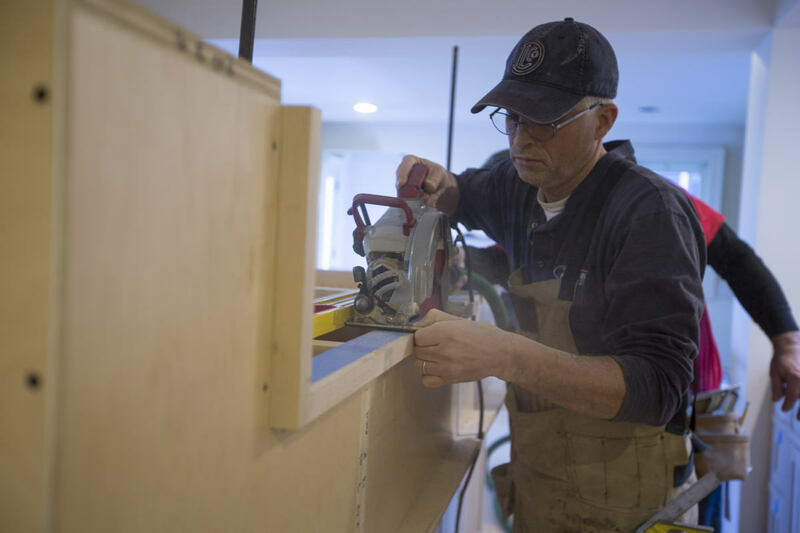 With that, attaching cabinets to the walls is standard—off the humps on the walls and shimming at areas needed to keep the face of the cabinet in a straight line. 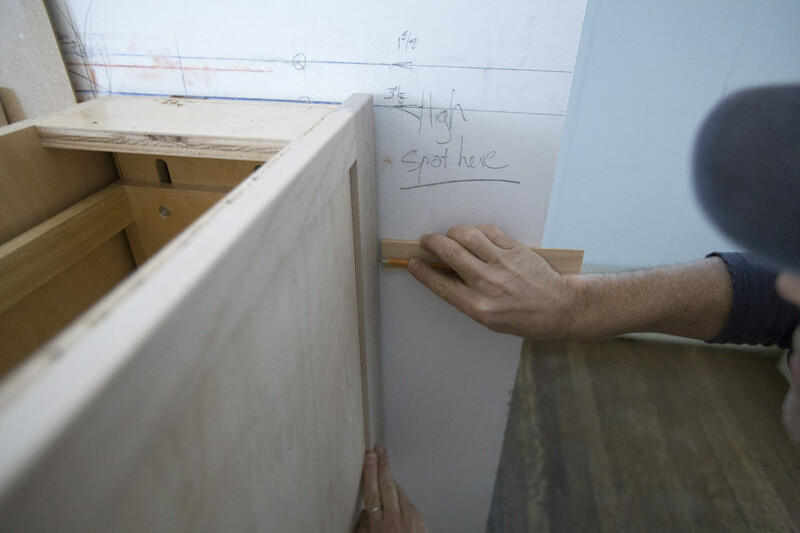 Before lifting a cabinet in place, it’s best to measure and mark on the inside of the cabinet back where the studs are located and preset the screws. This way, it’s just a simple matter of sinking the screws when holding a cabinet in place. Once all the boxes are set, reinstall all the doors and drawers and check for fit, just to be sure the cabinets weren't racked or stressed in some way. This is an important check, especially with inset doors and drawers. Be sure to adjust the doors and drawers once end panels, mouldings, and toe-kick skins have been installed. Then, check again after the painters are done. Many cabinets have the end panels separately shipped to be installed in the field. In this case, the base cabinet end panels are custom made to fit directly to the floor. To scribe these pieces properly, clamp the panel parallel with the cabinet top and face edges. For the island ends, the scribe and cut is at the floor. For wall base cabinets, the scribe and cut is at the floor and wall. 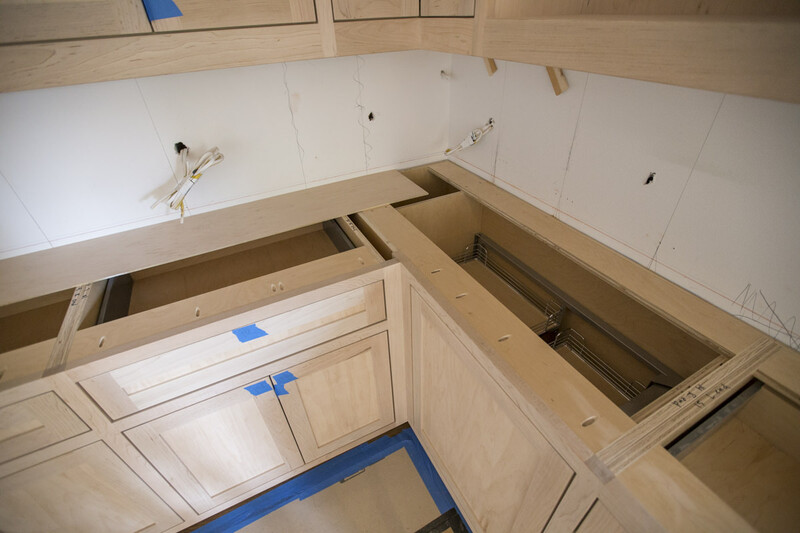 At some point along the scribe edges, the panel must touch the floor and/or wall and at the same time and be clamped parallel to the top and face of the cabinets. The panel will typically be about ¼" higher than the cabinet top, and a bit proud of where it will fit into the face frame. Again, these lines must be parallel. Measure the difference at the top and cut a shim that exact size to use to scribe the mark for the cut at the bottom. Do the same with the wall, using a shim for that size. The way to visualize the process is that the panel must be moved down to the floor and into the wall in such a way as to flush out the top and fit behind the face frame, as well as fit snugly to the floor and wall. There's one more important thing to remember with custom intersecting floor panels: Before they are manufactured, the cabinet maker will need to know the difference between the high spot and low spot in the floor. Why? Because if the panels are made with only ¼" available to cut off but the differences in the floors vary by ¾", the panels could be ½” too short in the low areas! 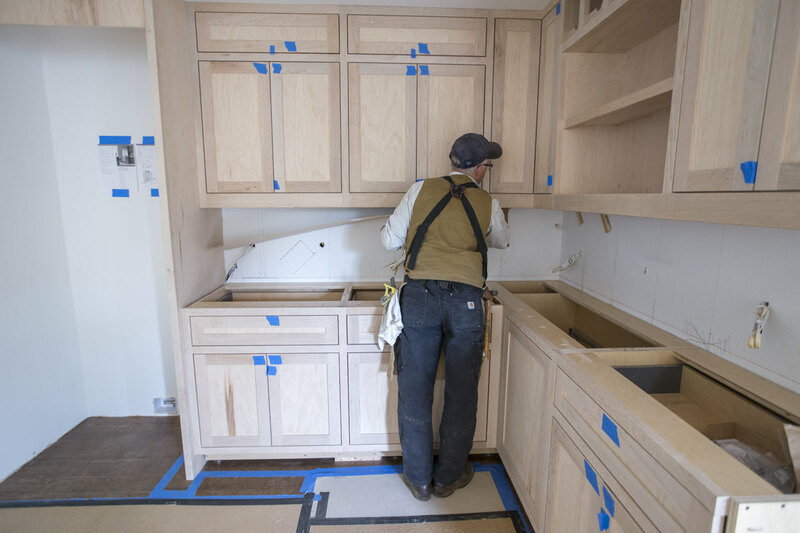 The key to installing custom cabinets is patience—and putting in work up front. If you take the time to find the high, low, and plumb spots in the floor, ceiling, and walls and measure before the install, you'll have a much smoother experience and a beautiful end result. Whenever you're working with a contractor it's important to get as much information in writing as possible, to protect both your time and money and theirs. Lock-Deck laminated decking is a fabulous choice when designing roofs, ceilings, mezzanines, and floors in homes, churches, or your next LEED commercial project. Lock-Deck is a structurally engineered product with multiple kiln-dried lumber laminations, which are bonded together to form glue-laminated decking.